I took all the time for the selection of an SAILDRIVE >> at least 6 months is required. Looking around at boat show's and on the www. Thousands of questions needed to be answered. How about the operation of a diesel engine ? And how about systems for cooling-, electrical- , exhaust-, fuel- etc etc ? 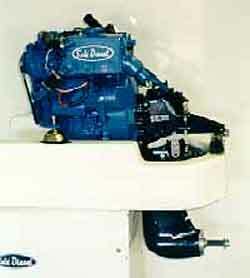 Wat is needed to fix a engine to the bottom tightly enough to insure seawordiness ? Which parts are needed and where to procure these ? Which SAILDRIVE is fitting the best ????? 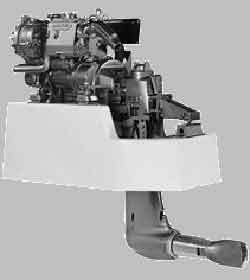 7,4 kW (10 HP) is the smallest size there is and sufficient in my 22 feet boat . 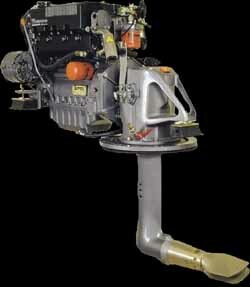 There are several manufacturers with excellent engines at favourable prices (see above). Because of the very narrow space in the interior of my Daimio, only the BUKH saildrive fitted completely below deck and behind the stairs (see left). Furthermore, the net weight of the BUKH is only 80 kilo's. Therefore i selected this SAILDRIVE. Later more about the engine, first we look into the design.